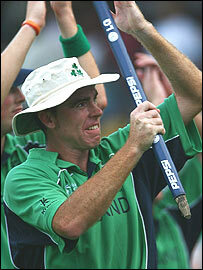 Ireland captain Trent Johnston has announced that he is taking a break from international cricket. Johnston announced his decision after playing in Ireland's third one-day defeat by Bangladesh on Saturday. "I've been struggling with various injuries and my body's telling me it's time for rest," said Johnston. The 34-year-old will play no part in Ireland's Friend Provident Trophy campaign but could return for the Intercontinental Cup later this year. "I've been a bit of a passenger in the field, and it's not fair on the rest of the team. "It's been no secret that I've been contemplating this for some time. "International cricket places a great strain not only on the body, but also on family life, and with a wife and two young children, I've got to prioritise. "There are also the demands on my time with work. I've now got a terrific job with Architectural Hardware, who have been fantastic with their support." Johnston indicated that he was hoping to return to the Ireland fold later in the year. "I do feel I've still got a lot to offer, particularly in the four-day format. "I suppose I could still field in the slips, and I've been in good form with the bat, so could maybe concentrate on that aspect of my game more. "I'll be sitting down with Phil Simmons this week and discussing my plans. "I don't think I'm up to the strains of one-day cricket any more. These three one-day internationals in the space of five days have nearly killed me. "It's only fair to give Phil a chance to build up a working relationship with William Porterfield now, rather than drop this on him in six months." Johnston will continue to play domestic cricket in Leinster, where he is captain of Railway Union. In addition to leading Ireland in the tremendous World Cup campaign, the Australian native has captained Ireland to successive Intercontinental Cup Final wins against Kenya (2005) and Canada (2007).